Get your promotional campaign on the right track with help of this racing kit! Perfect for a day at the racetrack, this 6" x 4.5" resealable bag is offered in an assortment of colors and comes filled with plenty of first aid and safety essentials. 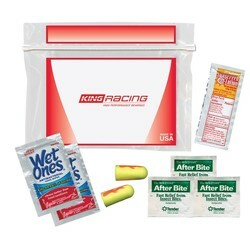 This is an ideal giveaway for race fans, construction workers, health and safety seminars and much more. For maximum brand exposure, customize each bag with a brand name, logo or other marketing message! 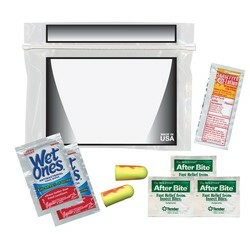 This kit includes 3 After Bite Sting Swabs, 1 Pair of Cordless Earplugs, 1 Sunscreen Packet, and 2 Wet Ones Wipes.